For over 40 years, "the Billy Meier Story" has been an intensely controversial "UFO case" like no other (so, we're doing "UFOs" now? ; keep reading ...). 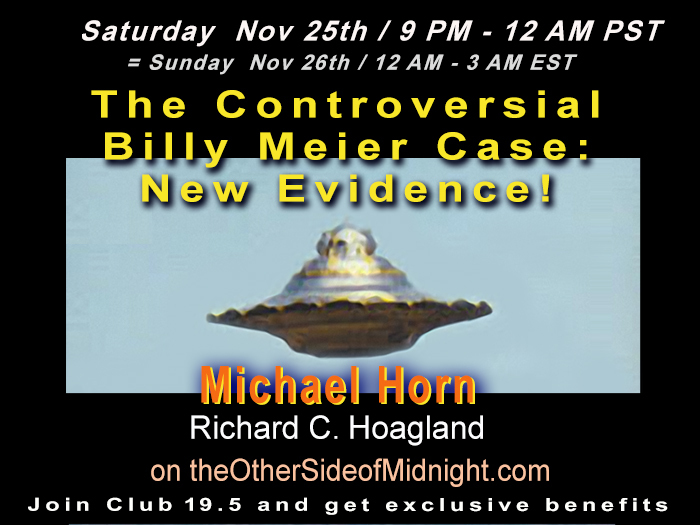 This Saturday night (November 25), "The Other Side of Midnight" -- for the first time anywhere -- will present startling, new scientific evidence firmly connecting "Billy Meir" to the full range of The Enterprise Mission's past ~40-years of independent extraterrestrial research. Startling new data on the sudden arrival, just a month ago, of the first acknowledged "interstellar asteroid" -- officially named "Oumuamua" (Hawaiian for "lead scout ... of a battle party" ...). Why are mainstream astronomers suddenly, openly, discussing the possibility that "Oumuamua" could, in fact, NOT be a "rogue interstellar asteroid" after all ... but, some kind of "directed interstellar messenger" ... for REAL?! And ... the planet Mars! ?